Marie Thérèse of France (Marie Thérèse Charlotte; 19 December 1778 – 19 October 1851), Madame Royale, was the eldest child of Louis XVI and Marie Antoinette. After her marriage to her cousin, Louis Antoine, Duke of Angoulême, the eldest son of the future Charles X, she was known as the Duchess of Angoulême. She became the Dauphine of France upon the accession of her father-in-law to the throne of France in 1824. 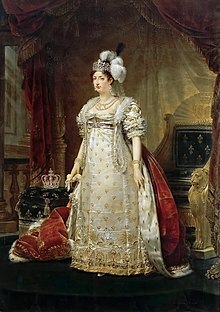 Technically she was Queen of France for twenty minutes, on 2 August 1830. This was between the time her father-in-law signed the instrument of abdication and the time her husband, reluctantly, signed the same document. ↑ Michelle Moran (2011). Madame Tussaud. Quercus. p. 430. ISBN 978-1-84916-137-4. ↑ Susan Nagel (2009). Marie-Thérèse: The Fate of Marie Antoinette's Daughter. Bloomsbury. p. 316. ISBN 978-0-7475-9666-0.